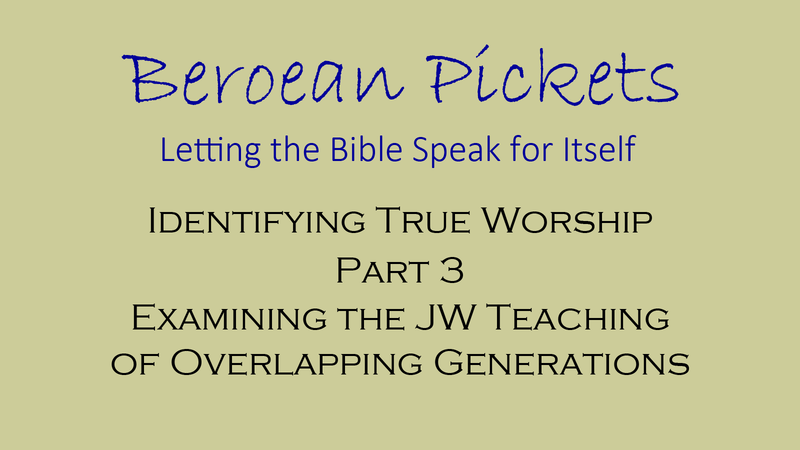 It’s all well and good to tear down a false doctrine like the JW overlapping generations interpretation of Matthew 24:34—as we did in a previous video—but Christian love should always move us to build up. So after clearing away the debris of false teachings that have been built on sand, let us build a structure that is solid, founded on the rock of the teachings of the Christ. 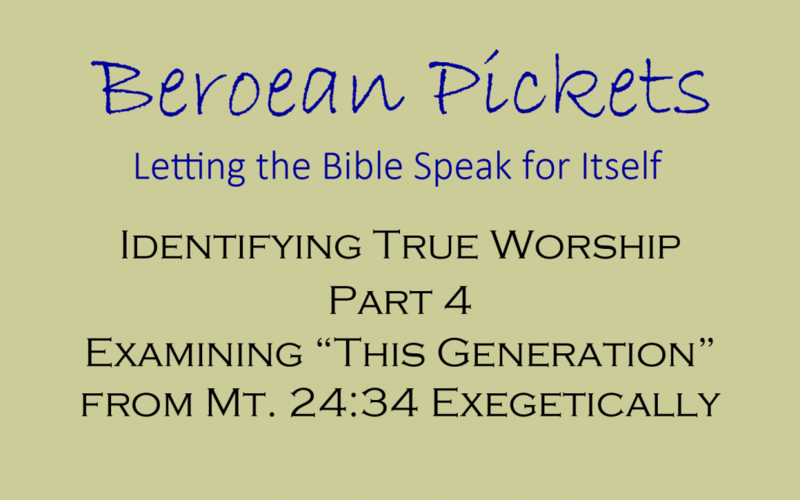 (Mt 7:24-27) With this in view, the next video in our series attempts to provide an exegetical interpretation of what Jesus meant when he referred to a generation that would not pass away until all the things he’d spoken of had occurred. I find this very fascinating. I think I understand most of it but I’m wondering about the tribulation reference and comparing the generic tribulation reference written in Matthew vs. the great tribulation reference in Revelation. Something that has always confused me is how the tribulation in Matthew is spoken of as being so bad that it will be worse than anything that has come before and worse than anything that will come after. And I’ve understood that particular tribulation to be speaking of the years surrounding the destruction of Jerusalem. But if we’re yet to endure the “great” tribulation, doesn’t the word “great” sound like it will be worse? I mean, from an outside observer’s perspective on history, even WWII seems like it was worse than what happened to Jerusalem. Does anyone have thoughts on this? I always feel like I’m missing the obvious, yet I keep missing it. I would recommend that you start by running “tribulation” through the WT Lib search engine and scan every occurrence of the word found in the Christian Scriptures. I don’t think you will see the basis for a “final test” or severe attack by “the Assyrians” as the Witnesses believe. Nor is there the basis for viewing it as phase one of a two-phase conclusion of the system of things, the second phase being Armageddon. Additionally, all those who are seen have come through the great tribulation. Are we to assume that the only ones in that vision happened to be alive at the end? What of the thousands or millions of faithful Christians down through the last 20 centuries? Clear and easy to understand Eric! Please keep doing videos, it has opened up a whole new world for us. Both my wife and daughter have trouble grasping the written word, but the visual,seeing and listening has made it easier for them. Eric, You are not promoting yourself anymore than if you stood on the platform giving a talk or in the market place or a synagogue. As we live on the other side of the planet, it can at times be lonely. Seeing a brother give a talk in our own home feels like we are part of the brotherhood where 2 or 3 are gathered together.We look forward to video 5 discussing 1914! 1. Great Tribulation is replaced in Luke 23-4 with great distresss and Jerusalem being trampled on by the nations. So that certainly supports the GT in Revelation being different to whatever it is in the 1st century. 2. The verse I find confusing is Luke’s parallel to “he is near at the doors”, as Luke 21:31 states “when you see all these things happening , know that the Kingdom of God is near”. How would you tie up those two expressions ? PS I agree that “coming out” is nothing less than brave, but also encouraging, while you look a lot better in a suit. Wherever this all leads, keep up the good work. We tend to think linearly in Western Society. We always to a chronological sequence. A leads to B, and B leads to C. It appears that these three accounts (Mt 24; Lu 21; Mr 13) are not written in the precise order in which Jesus spoke those words, and even if one of them is (Matthew’s for instance) we cannot assume Jesus was speaking chronologically. We have to bear in mind that of the three accounts of these prophetic words, none is written by an actual eye-witness. Matthew is the only one of the Apostles who even records the event, and he wasn’t there. The four who approached Jesus with their query were Peter, James, John, and Andrew. (Mark 13:3) So all the writers had to get the information secondhand, from one or more of the original four. This explains why the order in which Jesus’ words are revealed varies from one account to another. It also explains why some elements are missing from one account that appear in another. For example, Luke is the only one that relates Jesus’ words regarding the “gentile times”. (Luke 21:24) However, Luke does not speak of the unknowableness of Jesus’ coming as Matthew does at Mt 24:42, 44. Luke gives the impression that the disciples question was placed while they were exiting the Temple, but Matthew makes it clear that they asked him the question later that day when they were on the Mount of Olives. Perhaps they did both. Perhaps they asked Jesus the question immediately after he foretold the temple’s destruction, but he just chose not to answer and walked on. We cannot know. Luke 21:25 says “Also, [Greek, kai, “and”] there will be signs in the sun and moon and stars, and anguish of nations…” Some conclude that the “nations” are the tribes of Israel and that vs. 25-28 still refers to the first century distress or tribulation upon Jerusalem. I don’t concur, in part, because “nations” [“ethnos” in Greek] doesn’t mean tribes. I also find the context seems to support something other than what happened in the first century. I’m just speculating of course, but the purpose is to illustrate the probable way in which Luke, Mark, and even Matthew would have heard all these prophetic pronouncements. We must bear in mind that all this was written down before the fact. So they would very likely have assumed the signs in the sun, moon and stars, and the anguish of nations would have followed on the heels of the great tribulation to come upon Jerusalem. The order of what they were relating wasn’t important. What mattered was that they related all the words of our Lord, and thanks to the three accounts we have as complete an account as we need of what he said. It is now for us to figure out which pieces in the jigsaw puzzle go where. Am I being dense ? Not sure how that explains why Luke used “Kingdom of God “instead of “he”as Matthew did. Otherwise thanks for that explanation – appreciate the thoughts. I think that’s a matter of interpretation. Did Jesus say, in the context of “this generation” that “He is near at the doors” or did he say in that context “that the Kingdom of God is near.” We know that he Kingdom of God did not come when Jerusalem was destroyed in the sense that we expect it. For us, the Kingdom of God starts when Jesus appears to wage war. Yet, we also know that the Kingdom of God started in the first century. So not only has it drawn near, but has been around for 2,000 years. It’s down to what it means in each context. Luke uses the expression 32 times, more than all three other gospels combined. (Luke 11:20) But if it is by means of God’s finger that I expel the demons, the Kingdom of God has really overtaken you. (Luke 13:29) Furthermore, people will come from east and west and from north and south, and will recline at the table in the Kingdom of God. Thanks Meliti. I think that was my JW thinking trying to confuse me. So if Jesus started ruling (in the first century) then to that end the Kingdom of God is near (Matthew 28:18) . The rest is wait and see. But quite a long wait. Looking at the two expressions again, I wonder if it is simply Jesus, when he says, “he is near at the doors” and “the Kingdom of God is near” that he is telling us that he would be keeping his eye on those first century Christians, giving them the direction, one way or another, so that they could escape at the right time. Now that is the sort of thing I would expect from a good ruling king ! It’s a possibility. The fact is that the destruction came from the Romans, but they were just a tool in God’s hands, just as the Babylonians were back in 587 B.C.E. What I’m saying is that the identification of the “He” is largely irrelevant since it was what “He” was going to do to the city that mattered. Hi, I must admit I prefer the writings as I can read them while at work. But I also understand the videos have their benefit as well. Suggestion: if you first create your script / text for your videos, can you not also publish the scripts? Thanks Menrov. Actually, I don’t use extensive notes. Just a few keywords. I speak off the cuff. I find that when I have everything written down, I become wooden in my delivery. I used to give public talks from a PostIt note with just the Scriptures on it in case I forgot them. Just the way my mind works. However, what I can do is take the YouTube generated closed captions, clean them up and publish them. I rather appreciate how you keep things in context ErMeleti. Also the way you uncover their techniques and falsehoods. Keep those cameras rolling your just beginning to scratch the surface with a face unveiled! Best regards. I think you are losing me Eric. If you put down the microphone and pick up the pen then you’d have my support, but all this smacks of self-promotion, one of the many reasons a won’t listen to the GB. But thanks for all the articles in the past many were informative. That is, of course, what my JW friends believe. I’m only doing this for self-aggrandizement and self-justification. I was concerned as to whether the video medium would be the proper way to go. Of course, I’ll continue to write, but today, many people do not read. My purpose is to spread the good news the best ways possible, and the response that’ve I’ve received from these first videos tells me they are helping to accomplish that purpose. It is my hope that others will join me so that instead of a single voice, we become an army of voices. well said! wouldn’t it be wonderful?….. an army of voices! Well, Eric, I can’t think of a single group of people dedicated to self-aggrandizement and self-justification at all, can you? Oh, wait, the WT organization and the GB. How else would you describe those who say they are the only ones who have the truth, the only ones approved by God, who say every teaching is spirit-directed and is a manifestation of God’s sole channel of communication between Himself and mankind in action, that every man-made rule, policy, procedure and doctrine is Jehovah’s will and not to be questioned, who say that loyalty to men and loyalty to God are identically the same? But, heaven forbid, Eric, that by pointing out the plain truth of the Bible you might possibly draw attention to yourself. That’s a sure sign of apostasy. Just ask them. I just wanted to say that I have really appreciated reading your comments. I truly believe that Eric is not trying to promote himself, but rather, by revealing himself on camera, is actually paving the way for all of us to be able to reveal ourselves as well. The Org wants all of to cower down in a corner and not speak out. It would have been a lot easier for Eric to stay incognito and just “pick up the pen” as you say. I have come to know Eric personally in recent months. I truly believe he is doing what he is to sincerely help all of us. Also, his fine example has helped me immensely to start helping others “wake up” and follow the Christ. I like both the written articles and the videos. I think it is incredibly brave of Eric to make these videos, given the vindictive nature of Witness leadership. When I watch your videos, I see calm, rational and thoughtful words. Certainly not self-promoting words. Eric, please keep making the videos. You have, in a few short weeks, made a difference in the lives of many in my congregation, including my wife. Your example of fearlessness is inspiring.